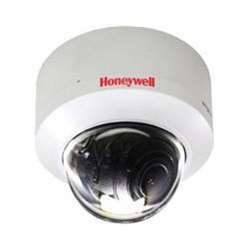 The Honeywell Video HD3UH is a System Series indoor mini-dome camera that features 1/3" CMOS, 800 TVL resolution, 2.812 mm VFAI lens, 12VDC/24VAC operation and NTSC format. Honeywells 960H System Series of cameras provides a wide range of high-quality, feature-rich video surveillance options for indoor, outdoor, and low-light applications. The HD3UH offers superb picture quality, true color reproduction, and enhanced low-light performance, making it the ideal solution for a range of indoor surveillance applications including banks, casinos, hospitals, schools, retail stores, and government and commercial buildings.